The Buddy FlamingoMic 7G Portable Microphone is a 17" unidirectional noise cancelling microphone. 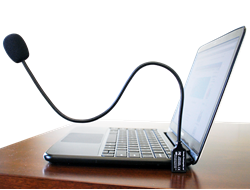 The FlamingoMic 7G Portable has a specially designed L shaped USB connector, designed especially for notebook, netbook and tablet PCs. Equipped with our revolutionary FilteredAudio technology for highly effective mechanical noise cancellation. 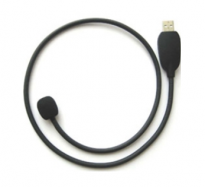 It is an ideal replacement for desktop or headset microphones for on-the-go dictation and speech recognition. The element is surrounded by 5 mm thick vulcanized shrink tubing to provide unmatched flexibility. 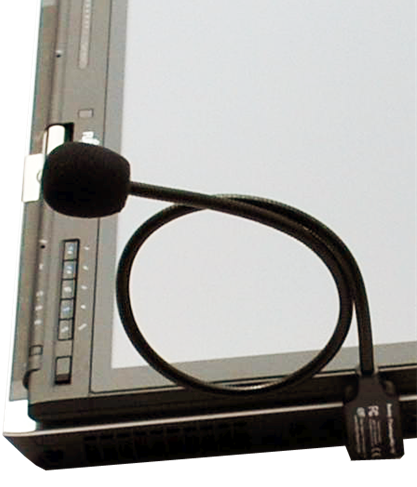 The microphone comes with a built in state of the art sound card which eliminates interference caused by on-board chipsets that are often placed close to noisy electrical circuitry and can negatively affect speech recognition or dictation results. This microphone is ideal for use with all portable devices. Contort this microphone into any desired position to suit your needs. The integration of our 7G and FilteredAudio technology makes this by far our highest quality FlamingoMic to date. The unrivaled combination of highly accurate speech recognition results and ease of use makes the FlamingoMic 7G an ideal product for use both at the office and on-the-go.